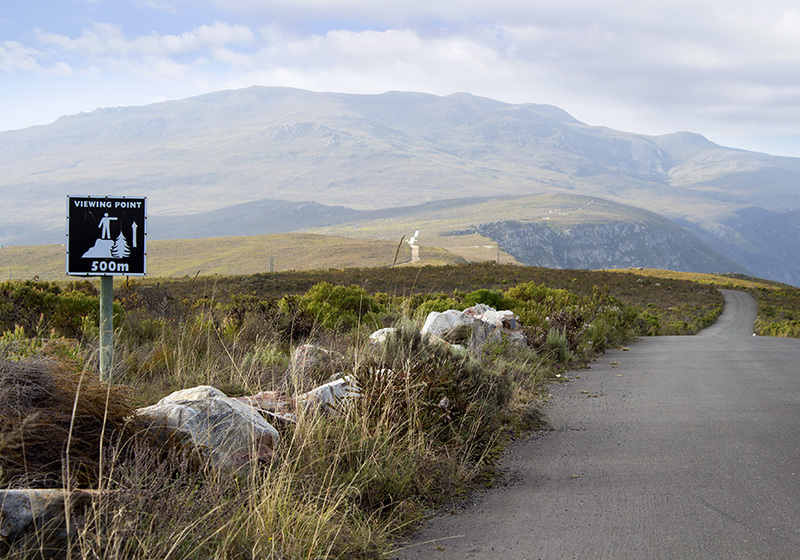 This short, tarred road leads up to the top of the mountain range at the beginning of Hermanus. To get there from Hermanus, travel out of Hermanus and towards Cape Town for about 2km. You will pass the Spar (Gateway Shopping Centre) on your left. Just after this turn right into Malva Road and follow the signs that say Rotary Way until your heading up the road. The final point is the parking lot at the end of the gravel road, which overlooks the ocean, the bay in which the whales can be found and Hermanus, giving the viewer an uninterrupted and stunning view of this pristine area. As you go along the road, you will arrive at the first point: the radion station. From here you can look upon the Western areas of Hermanus; such as Sandbaai, Zwelihle and Vermont in the distance. Heading further along the road, and on your left, you'll be able to see parts of the vast and abundant Hemel en Aarde Valley, which leads from Hermanus to Caledon via a 35km stretch. Next you will come upon the final part of the tarred road where you can view the Klein River Valley, Stanford, the Lagood and other points in the Gansbaai area. You can also see Hermanus Heights and the Hermanus Golf Course, as well as the New Harbour, Old Harbour and Gearing's Point, which is one of the main viewing points for whale watching. If you are capable, you can head further along the gravel road; passed the point where hang gliders launch out above Hermanus, until you reach a gate that marks the beginnings of Hamilton Russel's property. About 110 meters from these gates is the furthest points that vehicles may venture, which hosts a couple of benches from which to view the stunning scene before you. Whilst on the mountain, please make sure to take all necessary safety precautions so as not to have an accident. Also, the radio towers that you will be able to see should not be approached too closely as they are alarmed and armed response will arrive if you trigger any one of the alarms. Also, please do not pick any of the flora found on your trip or feed the baboons that will be hanging around. But most of all: Enjoy!